Contents: Rice, fruit (? ), meat (? ), slaw. Notes: The submitter didn't mention what was included. She describes it as "medium sized balanced meal." Please see my comment below. 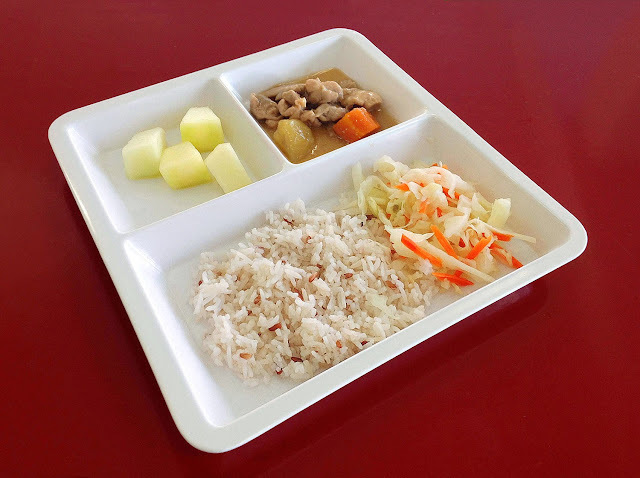 Also, I would really appreciate it if you could send me a picture of what you believe is a more accurate school lunch from Singapore. Thanks! That is DEFINITELY NOT a regular school lunch in Singapore. Maybe for an international school but not for your local schools. Like what KS said, students get to choose what they want to eat from a variety of stalls. How about taking a look at this, http://news.asiaone.com/News/Latest%2BNews/SoShiok/Story/A1Story20130510-421746.html , before sharing the wrong information with the world wide web. Ale and KS, Give Nick a break. A student who actually ate this at school in Singapore submitted this. The title doesn't say, school lunch that every single Singaporean child eats. It is one kid at one school. Much like schools here. I had a sushi cart from time to time at our cafeteria in Southern California. Most other schools probably didn't have that in the US. Would you then say that's misinformation? No. Because it would have been representative of what I was offered at school. Anyway, I like the site Nick. Ale, and KS, this was sent to me by a student living in Singapore. She stated that it was school lunch at her school. I'm sorry if you feel this is a misrepresentation.